Top insert and divider for 13x13x13 corrugated box. Box insert kit comes with 25 Top Inserts, and 25 Dividers. 13x13x13 box not included. 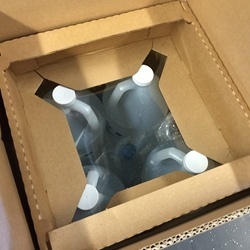 This Box Insert Kit is intended for use in shipping gallon containers in a 13x13x13 box only, and has maximum hold/strength when all four gallons are present. Due to the size and abnormal shape of this product, it will ship separately from your order. Please Note: Inserts are not pre-assembled, which allows for more affordable shipping.